Have you seen the Fall issue of Knitscene? I am proud to have my first print magazine published design in Knitscene. Back in October of 2010, I saw Lisa Shroyer's call for submissions for Knitscene's Fall issue. I looked at the mood board and thought about submitting. At that point, I had only self-published 2 of my designs on Ravelry. I had a design that I had swatched a month ago and wanted to send that in. But I wanted to re-knit the swatch in a different color. Well, time went by pretty fast and the deadline approached. I never did get the chance to re-knit it. I was left with 2 choices: not submitting or submit my design in the current color swatch that day. Well, I went for it and quickly sketched out my design proposal. I really had no clue what I was doing, but I did the best that I could. Drawing was never my strong suit in art school, but I was hoping my swatch could convey my idea. Melody was the one that kissed the package and dropped it in the mail box for me at the post office. She was my lucky charm. Honestly, I didn't feel that I had a chance of getting in but it wouldn't hurt to try. In the beginning of December, I got a email from Lisa that she loved my shawl design and the color yarn I used. In fact, she chose a yarn and color for the sample that is pretty much the same as the yarn I used. It was fate. When I got the acceptance email, I was jumping up and down. Melody thought it was funny and started doing the same even though she didn't understand why I was so happy. I immediately called my husband and then my sister. Even though they both do not knit, they were excited for me. I was on cloud 9 for a while. The shawl is knit from the top-down with a simple eyelet pattern and sections of stockinette. The border of the shawl is done with a crochet hook. You don't need to know how to crochet. As long as you can make chains with a crochet hook, you have all the necessary skills for the border. The finished shawl measures 60" wide and 27" deep at center point, after blocking. It's a full size shawl which is a first for me. I think there may be more full size shawl designs in my future. To celebrate, I am having a little giveaway. 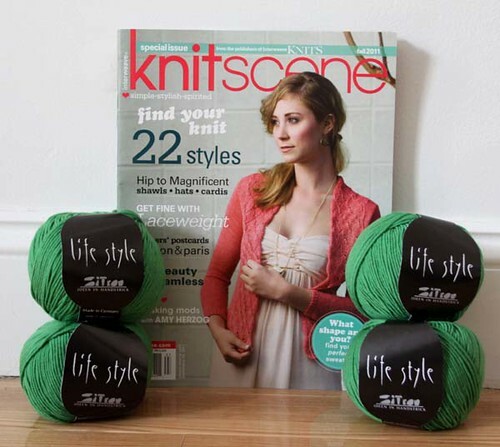 I am giving away a copy of Knitscene Fall 2011 and the same yarn/color (Zitron Lifestyle in Grass #59) to make a Colfax Shawl of your own. Please leave a comment that you would like to be entered in the giveaway. Be sure to leave a way for me to contact you, either Ravelry name, blog link, or email address. Giveaway ends on August 10, 2011. In the mean time, Ravel It. It has been fun seeing the projects show up on Ravelry. I love the variegated versions that some people are doing. This is so super awesome! I loved the shawl when I saw it but I feel like the story behind it makes it even better! I would love to be entered in your giveaway -- in the meantime I'm going to haunt some of the projects on Ravelry! This is so very exciting, Angela! I'll definitely share this post with my knitter-friends who don't already know your work, and in the meantime will keep working on my version in Happy Feet. Congratulations, Angela!! I like the picture in my head of you and Melody jumping for joy. Gorgeous shawl and gorgeous color yarn! Congratulations on being featured in Knitscene! Wow, congrats! It is a beautiful shawl, and I love the color! Congratulations! It is really lovely. And I love that Melody kissed it goodbye. That is awesome luck. I was in a similar situation this summer, having my first design submission accepted at a print magazine. I'm waiting impatiently for my design to come out in Jane Austen Knits. You captured the feeling exactly in this sweet post. This shawl is on the top of my "Make for Me" list right now. So as soon as I get some more baby stuff done it's up next. Would love to win the prize too! It's beautiful! As to be expected, of course. I really love the shade of green you chose, too. It's been so long since I've knit lace, I would love to win this! Congrats, and thanks for the generous giveaway! Congratulations! I need to get my knitting needles warmed back up for fall/winter stuff and this would be awesome! So proud of you! Keep 'em coming! 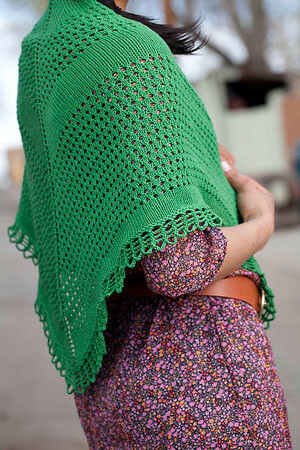 That's a lovely shawl and I like the green color, it reminds me of spring! Congrats! How sweet that your little girl gave you good luck ;) By the way, gorgeous color and design. Congratulations! The green caught my eye when I was browsing through the magazine recently. That is excellent news, Angela! I'm so happy for you! All your patterns are awesome! I'd love to be entered in the giveaway - thanks for sharing the love! Congrats! What a lovely pattern and I LOVE that shade of green! Thank you, my niece did like the shawl! Congratulations on your submission acceptance for the shawl pattern to appear in Knitscene! What an honor! Oops! For the giveaway,my Ravelry name is: Heavenlybabies. Thanks for your generosity! 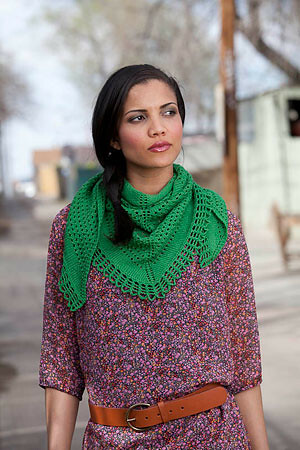 Wow, that is a gorgeous shawl in a beautiful color! Please enter me in the drawing. My Rav name is crekamakesthings. Thank you! You SHOULD be proud and happy dancing, Colfax is AWESOME! My fav right now. Congratulations! It is a lovely pattern. You (and Melody) deserve to be jumping for joy. How excited are you? Well done! Kissing can't hurt! I hope I win! Would love to! I feel like a pumpkin in a pumpkin patch...."pick me! Oh no, pick me"
Congratulations on your print publication! Very exciting, and such a pretty pattern. I'd love to be entered into your drawing. 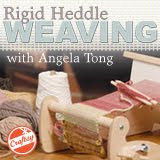 I'm reedsandstrings on Ravelry (and that is also my gmail address). Congratulations!!! I'm so extremely happy for you and hope this is just one of many many more "my design is in a magazine" posts. Congratulations on your first magazine design being published. I really love the color of the shawl and the design is very pretty. I am sure this is just one of many for you! I am so excited and happy for you, Angela! I will definitely have to knit your design. I actually live very near a town called Colfax. Congratulations!!!! What a Fabulous accomplishment !!! It very exciting :0) I can't wait to knit this pattern !!!! Congratulations. I'm trying to finish Kouyou, my second try at lace knitting. Your instructions are so clearly written. I'm already planning to knit the Colfax shaw next! Awesome pattern, great blog, plz enter me in giveaway. also congratulations. Congratulations! I love reading your blog! The shawl is beautiful and in my favorite color, green! Angela! This is so beautiful, and I am so proud of you. I think that says it all, about the way I feel right about now. Congratulations! I simply must throw my name in the hat! This is beatiful! Congratulations!!! I'm so excited for you. The pattern is gorgeous and I love the color. It must be surreal to see you beautiful pattern in print along with the great photos. So glad you went for it! Reading this and seeing the pictures makes me so excited for fall. I can see this as the perfect accessory for November. I'd love to win your pattern and lovely yarn. It's absolutely lovely! Your shawl is just awesome! I look forward to seeing more of your work in the years to come. I would love to enter your drawing - that green color is just screaming my name. Oh yes please, what a lovely project-- thanks for the chance to enter the giveaway! Congrats, Oiyi. I have been following your blog for a while now and you so deserve that publication. You have the talent to combine clear patterns into great looking garments... and this one in my favourite colourway: GREEN. I love your generous give-away and like to enter... I am love2stitch on Ravelry. Congratulations! I love that shawl. Lucky you that your daughter is so supportive of your ventures. What a lovely and generous give away. Count me in! Congratulations! I love the design and especially the fact that you added a little crochet in there too! I am big fan of shawls these days and this one is perfect! Congrats! It must be super exciting to see your shawl in a mag and on Ravelry! huge congratulations!!! so excited for you!! :-) WOO!! Wow, so glad to hear of your fame! Beautiful design. I hope you create a bunch more too. WOW! I love the design & the color of this shawl :-) It is perfect in every way and that is so sweet that Melanie kissed the package and brought you good luck! Congratulations! Gorgeous! I love how they styled it. Congratulations! Welcome! I hope you enjoy seeing my projects and creative endeavors. My hobbies are: knitting, crochet, spinning, sewing, quilting, weaving, cooking and baking. Click on the picture for a discounted price or to find out more! Please be kind and do not use any content or photographs from this site without my permission.